FIVE YEARS AGO TODAY, the staff of the Honolulu Star-Bulletin, led by bagpipers, marched down South Street from the News Building on Kapiolani Boulevard to its new home at Restaurant Row. Others joined the march, including members of Save Our Star-Bulletin, a community group formed to help preserve the paper. Many doubted that such a march would ever take place. 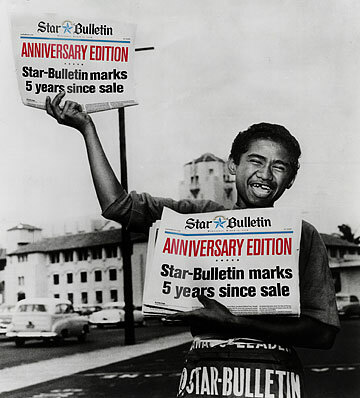 During the 18 months leading up to it, the fate of the Star-Bulletin hung in the balance as legal twists and turns played out. But in the end, David Black's purchase of the paper cleared every hurdle, allowing the Star-Bulletin to separate from its joint operating agreement and become an independent newspaper. Along the way, he bought MidWeek, which provided a press to print the Star-Bulletin and an established publication that was entrenched in the marketplace. As a result, the oldest continuously published daily newspaper in Hawaii rolls on, ensuring that the community has another voice and another watchdog. 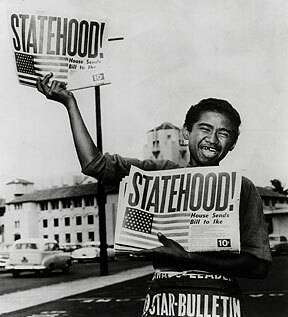 Star-Bulletin photographer Albert Yamauchi captured this image of news carrier Chester Kahapea selling copies of the Honolulu Star-Bulletin on Aug. 21, 1959, the day Hawaii became the 50th state. This photo epitomizes the joy and excitement of the day as Hawaii became the last star on the American flag.